Submitted 6 months 4 weeks ago by feeds_user. 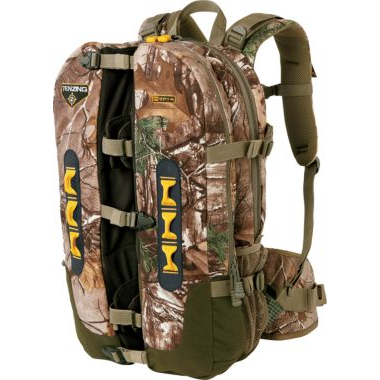 Tenzing TCSP14 Shooter Pack Split center offers a stable shooting rest Breathable mesh back pad keeps you cool Padded hip panels eliminate painful friction Integrated rain cover keeps contents dry Lightweight, durable and ultraquiet construction Compatible with up to a 3-liter hydration reservoir With a split-center design for carrying a crossbow or rifle and doubling as a stable shooting rest, the Tenzing TCSP14 Shooter Pack is a lightweight hunting pack that lets you remain mobile. A breathable mesh back pad keeps you from overheating, while padded hip panels let you carry the pack with nonpinching comfort. Nine compartments and pockets keep gear easily organized for quick access. Foldout rain cover keeps contents dry when the weather gets ugly. Multiple zip pockets and compression straps offer customization and security. Durable Dyneema® and ultraquiet tricot construction. Compatible with up to a 3-liter hydration reservoir. Imported. 21"L x 11"W x 4"D. Wt: 4 lbs. 6 oz. Capacity: 1,600 cu. in. Camo pattern: Realtree XTRA®. Cancer and Reproductive Harm- www.P65Warnings.ca.gov.